This is the one room in the house from which all the other rooms are accessed. It’s the first area people see when they come in and, as such, I wanted to capture my taste here and really show my style. As with other areas, monochrome is very much the name of the game. I got a lot of inspiration from Instagram and Pinterest with this area and it is one of the best complimented areas of my home. I got those circle canvas prints probably ten years ago when I went on holiday one time with my parents. I honestly can’t remember where it was. But, as much as I liked them, they just didn’t fit with my style and the look that I wanted, so they went into storage. I really did keep a folding bike in the entryway part. This was the only place available for it and it used to drive me mad. The front door used to constantly hit it and it used to leave a lot of marks on the wall behind it. The bike has also gone into storage in the loft as I no longer use it. I am hoping that the exterior reno project will bring the benefit of bike storage so I can bring it back into use. The wall art by the stairs was nice, but with wanting a very pale grey for the walls in the 2017 makeover, it had to go. The Hallway was the one area of the house that I did not paint myself. My dad did this while I was away at work. I remember coming home and smelling the paint and how pleased I was with how it was coming on. The colour of paint used here is “White Mist” from Dulux. I’d seen people do “gallery wall” features on Instagram where people had large collections of photos hung up along stairwells. I was inspired to do the same so I set about buying lots of frames cheaply from B&Q and printed off some photos myself. I initially got a few photos professionally printed, but eventually couldn’t be bothered with the hassle or the cost, so I printed them myself at home. I think the quality is still very reasonable! Being an instagrammer, and taking way too many photos on my phone before I discovered Instagram anyway, there was certainly no shortage of photos to choose from. Me and my dad hung them up and it turned out to be a much loved feature of my home. Check out the slideshow below of us putting it together. The top picture is in fact a butterfly print inside a perspex square and was bought from Next. The print with the “17-04-2014” date was made by myself and references the date I bought the house, the 17th of April, 2014. In the photo above, I have a few different images in use, namely a photo of the Norwich LGBT Pride Festival in 2016 and my mum’s cat, Flora. The “Follow Your Heart” print visible above was gifted to me by the lovely people at LXR Prints (who can be found on Instagram) at the Housewise Brunch event in Leeds, July 2018. I had such a fantastic time at this event and met so many great followers there, plus Lauren of Housewise is one of the nicest, loveliest people I have ever come across. I know I have had a great time at something when I feel sad to leave it and really quickly started to miss everybody I met, plus some of my most loyal followers were there and I can now call them friends in real life, not just on insta. I really can’t wait to go back and I am so happy that I have a great souvenir of the occasion to look at every time I come and go! I wanted some wallpaper for the back wall and, again drawing inspiration from Instagram accounts, found some stripy wallpaper from B&Q. This also has a subtle glittery aspect to the darker stripes. The pelmet came down in the process and was covered again with some black feature wallpaper left over from the bedroom I had when I lived with my parents. As with the painting, my dad did this while I was out for work. The CD tower visible to the right of the window was from Bedroom 2 but was painted black and moved to here. As with most other areas of the house, the skirting boards and door frames were painted grey (Light Rain Eggshell from B&Q Colours). This little stool from The Range fits in nicely with the wallpaper! One of the final touches here was to add a mosaic heart-shaped mirror, which I got for Christmas in 2017 but was from eBay. Never underestimate the power of eBay for finding great stuff. Hearts are a recurring motif in this house so it’s a nice way to continue the theme. Heart mirror from eBay. The ornament next to it is from The Range. I can’t believe how popular this photo was when I posted it on my insta. Who would have thought a photo of three doors would be so popular? Another thing for the Hallway is the ceiling light. It’s a “shadelier” from Next, my favourite shop. As for the light itself, it’s Philips Hue like the rest of the living space, but in order to fit it we had to change the light fitting as it only took fluorescent light bulbs (the ugly U-shaped kind, ugh!). The Entryway is the name given to the downstairs area where you walk in. Being a coach house, this is the entire downstairs, except for the garage and its cupboard. With the bike up in the loft, I picked up a small bookcase from Argos, which I got reduced to £8 after some gift vouchers obtained from previous Philips Hue purchases. This really helped tidy up this area. This is the “brain” of the house, where all the hubs are that control the house’s lighting and heating systems. The bookcase and its tidied up electronics. Heart ornament is from Next. As you can see, the floor here was also tiled. These are from Crown Tiles (the Agora Blanco variety, which is a marble effect). 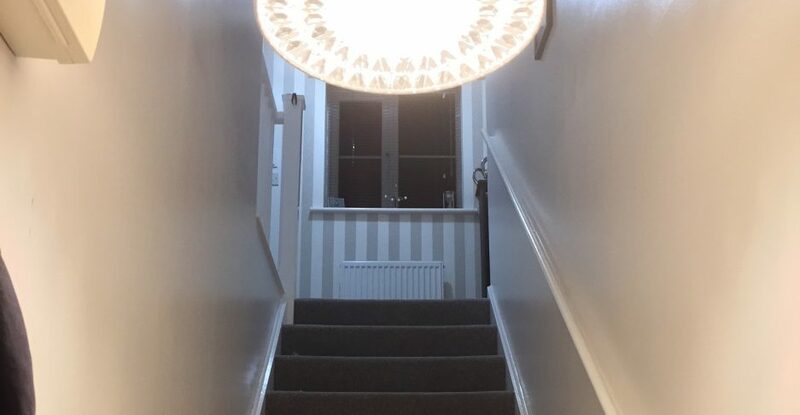 This area doesn’t get a great deal of natural light so I felt it would be beneficial to introduce not only a lighter surface, but one that would help bounce the light up and through the stairwell. The tiling here was done at the same time as the Kitchen and that has the same tiles now. I’ll blog about that when I finish the Kitchen off. The tiling was done with the help of an uncle with a lot of renovation skills. And here is the finished product! What a difference. The finished Entryway. Door mat is from Next. It’s no secret that I love my tech and these areas of the house have some bits that are, in my opinion, worth writing a bit about. The Hallway is home to the Hive Active Thermostat, which is part of the Hive smart home system. The original thermostat was replaced by this system in 2015. Below you can see it on the window sill and a screenshot of the app that you can use to control it. Options to temporarily have it on a high “boost” setting and to have a schedule are also included. Since this was introduced, there have been more sophisticated systems made, such as the Nest smart thermostat, but in my honest opinion, it is really not worth the upheaval of making the switch and dismantling the hardware attached to my boiler. The other thing is also a part of the Hive system and that is this motion sensor above the front door, which is a much more recent addition. Firstly, if someone enters my house I can get alerts sent to my phone, wherever I am. This is a nice security feature and also useful to know that, for example, my mum or dad has turned up to drop something off if I am expecting them (I often amuse them with a “Thank you!” text when I know they’ve been). Secondly, when it detects me leaving the house, the heating cuts out. I found that I was becoming so forgetful to turn the heating off, even with the ability to turn it off remotely, which I put down to previous mental health difficulties. As a result my previous energy bill was quite painful, which wasn’t helped by the Beast from the East. This should save me a lot of money in the future. Finally, it controls the light in the Entryway. The light comes on when it detects motion at night and turns off after a minute. This means that there is always light when I come in the house straight away. It is also useful because, surprisingly, there is no way to turn on the light from upstairs, so it comes on as you walk down.